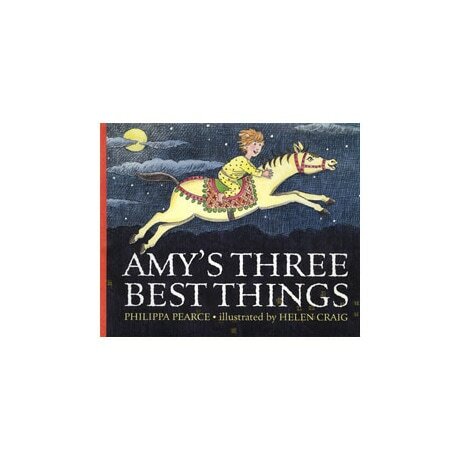 To prepare for her three nights at Granny's house, Amy packs her three favorite things: a striped mat, a tiny wooden horse, and a toy boat. Although she has a good visit, each night Amy gets a bit homesick; fortuantely her items magically transport her so that she can look in on her family, in this tale for readers 4 to 8 by the author of A Finder's Magic and The Squirrel Wife. On the final night, Amy is crestfallen when she finds that her family isn't home. Is something wrong, or is her mom preparing a great surprise for her? Best known for Angelina Ballerina, Helen Craig uses pencil and watercolor to believably and cheerfully depict the little girl's adventures.